You probably already use Facebook, Twitter, or some other social media site in your personal life, but don't overlook its potential benefits for your food business. Social media is a one-stop shop for many of the tools you need to grow your business. It connects you with people who are interested in products like yours. It is a source of instant feedback and a market research tool. It helps you bond with customers and potential customers. It can be used to promote a sale or other special event in an instant. But you have to be proactive. Don't just "lurk." Sign up for groups of people who are interested in your kind of product. Comment on other posts or simply "like" someone else's comment. You're networking and forming bonds with your customers, just as you would strive to do in person. There are many social sites out there, but Facebook and Twitter dominate for this purpose. A 2018 survey by bar supplies retailer Nisbets found that Facebook was the most popular social media platform for catering businesses. Eighty-one percent of respondents cited it as the most important tool for their marketing efforts, according to ModernRetaurantManagement.com. Twitter followed as the second most popular social media platform, with 20 percent believing it has helped their marketing strategy. There are many other social sites, and there’s nothing to stop you from posting on them as well to get the greatest possible audience for your efforts. Instagram and YouTube, in particular, are great for pictures and videos because their users love to “share” them with friends. 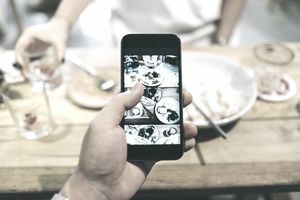 David Hochman of DJH Marketing Communications offers some explanations of how to make social media work best for a food business. Hochman does not see social media as a standalone vehicle but as part of a marketing strategy. "It enhances your traditional marketing and PR vehicles, which include print, radio, TV advertising, search engine optimization (SEO), telemarketing, direct mail, email marketing (such as Constant Contact), and press releases," he said. In other words, social media is strongest when you have one or more marketing tools working for you. But social media has attributes that traditional media lack. Hochman cites the deli manager of Sickles Market in New Jersey, who wanted to do an "all soups 15 percent off" promotion immediately. A coupon would have had to wait for a printer's schedule. Facebook had the offer posted within an hour. The deli's customers showed up for the promotion the same day. The fancy term for it is friction-less marketing. "The interesting thing here is they were able to compare traditional marketing of the past to this new social media effort, and they saw a sizable increase in sales," Hochman explained. Consumer needs and preferences change rapidly, and older methods like the focus group are just a snapshot of consumer feedback. If you stick with it, social media participation will give your customers real-time access to your products and the people behind the company. Social media allows you to create an identity in ways that were unaffordable in the past. From a marketing and branding perspective, every entrepreneur can personalize their brand, in the fashion of Newman's Own or Orville Redenbacher. From a purely operations perspective, Facebook, Twitter, and blogs also can help reduce inbound calls to your company, lowering operating expenses. For a cash-strapped start-up, social media can level the playing ground. Public relations, advertising agencies, and traditional media placements are beyond the reach of many small businesses. Using social media, you can develop and publish your brand story and your messages directly to specific market segments, all on your own. What kind of user engagement are you seeking? You can use social media to support the retail channel. That is, you want more people to look for your brand on store shelves. Or do you want to convert them into direct customers? In that case, your goal is to direct them to an e-commerce website. You can do both, but you should prioritize one or the other. How will you keep your audience engaged? You can give stuff away for free or run other types of promotions. You can create compelling content. You can mix it up but, again, you should prioritize. How will you respond to user activity? Once you get started, you can’t let your social media efforts languish. Develop a marketing calendar with careful consideration, and stick to it. How do you measure success? Return on Investment (ROI) can be measured in other ways besides increased revenue. Your social media presence is inexpensive or free, but time and effort carry fixed costs. It comes down to the old adage "time is money." But if your social media strategy enhances your brand, brings in customers or increases sales, the investment is worth it.